Fortnite's audience and reach are peerless, so it's no surprise to see it attract some strange legal issues. That being said, I have to admit I never expected to see it used as a vehicle for money laundering by international criminal groups. 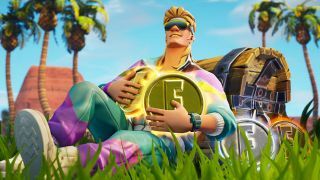 According to a joint investigation from The Independent and cyber security firm Sixgill, Fortnite's premium currency, V-Bucks, is being used to launder money. Simply put, criminals use stolen credit cards to buy V-Bucks, then resell the V-Bucks in order to launder or 'clean' their profits. This operation preys on "Epic Games' weak security measures," said Sixgill analyst Benjamin Preminger, and has been managed "with relative impunity." The goal of money laundering is relatively simple: to render illicit money more difficult to track by 'laundering' it through legitimate channels. Stolen credit cards would immediately raise eyebrows at a bank or government agency, but income generated from V-Bucks sales is less suspicious; though you'd think someone - like, I don't know, Epic - would wonder why V-Bucks are routinely passing through specific accounts. The stolen V-Bucks are being sold on the dark web in large quantities, The Independent reports, and on the open web - that is, the normal, public web you are currently on - in more normal amounts. Unsurprisingly, payment is often processed using cryptocurrencies like bitcoin and bitcoin cash, which are more difficult to track than standard methods. In other words, digital money is being used to conceal digital money which is being used to mask actual money. Got it. "Sixgill agents uncovered operations being conducted around the globe in Chinese, Russian, Spanish, Arabic and English," The Independent reports. The investigation didn't determine how much money this particular group of criminals has made off this operation, though Sixgill did estimate that Fortnite items "grossed more than $250,000 on Ebay in a 60-day period last year." Additionally, the firm found that "mentions of Fortnite on the dark web have risen in direct correlation with the game's monthly revenues." Epic profited $3 billion in 2018 - that's three billion dollars - so I reckon there are probably a few searches at this point. Fortnite has seen small-time V-Bucks scams before, but this kind of operation is on a whole other level. I mean, the biggest game on the planet is being used to augment credit card theft. Not a good look. The good news is players can easily avoid shady V-Bucks vendors like these by sticking to legitimate first-party channels like Epic's store or the official storefront of their platform. How to get free Fortnite V-Bucks? There are a few legitimate (albeit slow) ways to earn V-Bucks just by playing Fortnite, but players should avoid any group promising free money.